Lahore (Agenzia Fides) - A church in the city of Shahdara, near Lahore, was burned by unknown persons. 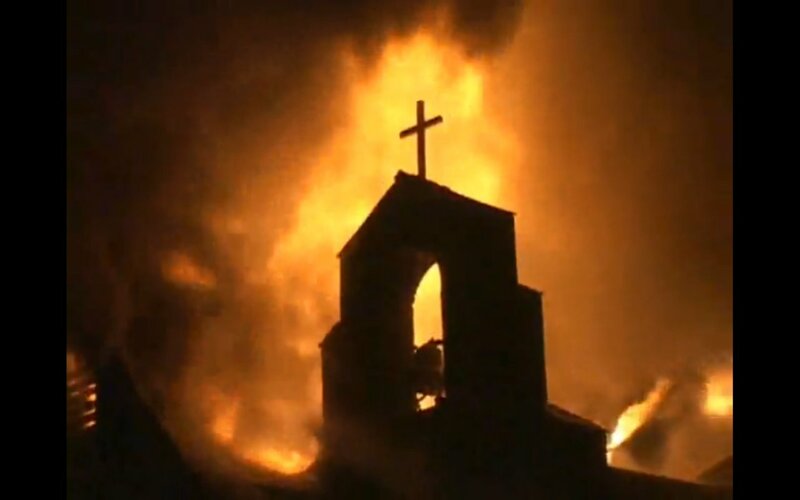 As ascertained by the investigators, the arson broke out Sunday, April 15 because in the liturgical hall a sort of "artisan molotov bomb", made of fabrics impregnated with fuel was launched, which caught fire and in a few minutes burned all the inside of the building. The police registered a complaint against unknown persons. Mohammad Waryam, inspector of the police station of Shahdara, speaking to Agenzia Fides, said: "We have begun the investigation, but there are no eyewitnesses". The church, in the process of being completed but already accessible and regularly used for worship, belongs to the evangelical Christian community known as "The Gospel of Jesus Mission". The Church is open on Sundays for morning mass, in the afternoon for catechism and in the evening for youth meeting. The attack took place half an hour before catechism. The area is bounded by a wall and it is not easy to enter. The Christian community has lived in the city for almost four years, serving some 300 Christian families. The Pastor of the community Yousuf Aziz speaking to Fides notes: "We have not received any threats and we are not in conflict with anyone, this criminal act is shocking for all of us, everything was burnt: mats, rugs, chairs, furnishings, crosses, sacred books like the Bible, hymn books, catechism books". The Pastor continues: "The members of the community are in tears in seeing their Church like this, we pray for the guilty and leave everything in God’s hands. God will protect his people". In an interview with Fides, Archbishop Joseph Coutts of Karachi "condemns this criminal act" and, also recalling the recent aggression against the Christians of Quetta (see Fides 16/4/2018), says he is "worried about the protection of Christians in Pakistan". The National Commission and "Justice and Peace", within the Catholic Bishops' conference, has organized today, April 17, a protest demonstration across the country to express solidarity with the Christians of Quetta and Lahore: Fr. Bonnie Mendes, priest of Faisalabad, comments to Fides: "We note that attacks against religious minorities are increasing. The government must take serious measures and not underestimate the phenomenon".